Since the fall of the Soviet Union, we have witnessed a rapid transition from communist governments to more democratic forms of government in Central and Eastern Europe. In most of these situations, the changes and pre-transition analyses have focused on the areas of political, economic, and legal transformation and have paid very little attention to the impact such adjustments will, and have had, on the people of these countries and their adaptation to them. Something that was seldom taken into consideration by the policy makers of these countries during the introduction of “new reforms” was the fact that often the needs of a country in transition clash with the physical and psychological needs of its citizens. The people that lived under these totalitarian regimes had to survive within a “culture of fear.” Like the people of Cuba, they developed a set of values and attitudes that defined their daily behavior in order to align their own wants and needs to the restrictions imposed by the state. This pilot study attempts to capture the values and attitudes of recently arrived Cubans in Miami, and therefore provide the closest possible approximation to the perspectives of Cubans still on the island, through a highly specialized methodology. The collected data was subsequently analyzed to provide some guidance for future policy makers. It is our position that for a successful transition to take place, those involved in making the decisions about the future of Cuba must understand and consider the “human factor” when attempting to establish a more free society in Cuba after Fidel Castro. The primary research objective of this pilot study is to understand value orientations and opinions on important issues pertaining to life in Cuba by studying recently arrived Cubans in Miami. The data from this pilot study will be submitted to government funding organizations with the purpose of pursuing a larger study. The larger study will involve comparing the value orientations of recently arrived Cubans to the different generations of Cubans already residing in Miami for more than one year, including those who arrived in the U.S. in the course of the last four decades and those who where born in the U.S. to Cuban parents after 1959. Ultimately, this study will attempt to analyze whether there is a disparity level in value orientations and societal viewpoints between Cubans living on the island and those in Miami. Understanding these differences will be important if the reintegration of the two groups occurs as a consequence of future political and governmental changes. Failing to address the likelihood of differences between the two groups may result in a problematic reintegration. Hughes (1993) defines “Culture” as: (1) a socially transmitted system of ideas; (2) that shapes and describes experience; (3) gives names to the surrounding reality; (4) is shared by members of a particular group; and (5) coordinates and determines behavior. He defines “cultural process” as a means of conveying values across the generations. Cultures, in turn, develop a system of “Social Values,” which are defined as the “ideals, customs and institutions of a society.” They: (1) are deeply influenced by the surrounding reality; (2) vary from one culture to another; and (3) may change over time (from one generation to another), as each generation adapts to new and different realities (Hughes, 1976; 1993). For Cubans, two major cultural groups have evolved over the past 45 years: the Cuban community on the island and the Cuban community in exile. Each cultural group has faced and adapted to dramatically different historical and environmental circumstances. The most notable circumstance has been that Cubans on the island have been governed by a totalitarian, communist system, whereas Cubans who immigrated to the U.S. and other places around the world have lived in a capitalist, democratic, free-market economic system. Since each Cuban group has faced dramatically different historical and environmental circumstances over a period of four decades, the value orientations of each cultural group will very likely differ in a variety of ways. Also, it is very likely that different generational life experiences will account for differences in value orientations within the same cultural group. Kluckhohn and Strodbeck (1963) were the first researchers that designed a validated instrument with the purpose of measuring value orientations. They measured the value orientations of the members of different cultures targeting five domains: (1) how the individual understands the character of Human Nature (good vs. evil vs. neutral); (2) how the individual relates to authority, (paternalistic vs. egalitarian vs. individualistic); (3) how the individual orients himself with respect to time, (tradition-past vs. present vs. future); (4) how the individual chooses to use activity, (pleasure vs. ambition vs. spirituality); and (5) how the individual relates to Nature (subjugated by it vs. in harmony with it vs. subjugates it). This pioneering work has served as a model to many other investigators. For example, Szapocznik and collaborators (1978) adapted the original questionnaire and measured value orientations in exiled Cubans residing in South Florida. They employed their findings to design culturally appropriate mental health treatments for this population. Other researchers have since used the instrument. Santiesteban (2001) has recently modified the original research instrument used by Szapocznik and colleagues in 1978. Inclán (1985) adapted the same research instrument to measure the value orientations of working class Puerto Ricans living in New York City, in order to design more culturally appropriate mental health treatments for this population. He highlighted the differences in value orientations that existed among Puerto Ricans of different socioeconomic backgrounds, bringing attention to “social class” as an important variable to be taken into account when measuring value orientations. One of the results of the Cuban communist revolution of 1959 has been the fragmentation of the Cuban community and the Cuban family. This “Cuban Diaspora” has continued without interruption since 1959. Many Cubans on both sides of the Florida Straits have placed their hopes on a future re-unification and reconciliation of the two cultures. The systematic understanding of the differences in value orientations among the members of the Cuban community on the island and the Cuban community in exile constitutes a cornerstone in the planning and executing of an efficacious and successful future reunification and reconciliation between the two Cuban cultures. The collapse of the Soviet Union in 1991 marked the beginning of political events that have brought with them significant changes in U.S. foreign policy toward Cuba. Since 1959, Cubans arriving in the U.S. were treated as political exiles, rather than financial immigrants. They received financial assistance from the government and enjoyed a welcoming attitude and certain privileges not afforded to other Latin American immigrants. After the Guantanamo Boatlift of 1994, in which approximately 37,000 Cubans were intercepted at sea and interned in refugee camps in the Guantanamo U.S. Naval Base, the U.S. government reviewed its policy toward Cuban immigrants and made changes. As of 1994, Cubans lost their status as political exiles and are now considered financial immigrants. The Cuban and U.S. governments set a yearly quota of immigrants to be accepted into the U.S., and those Cubans intercepted at sea in an attempt to reach the U.S. are now returned to the island (Nackerud et al., 1999). Many changes have also taken place inside of Cuba. A strong dissident movement with worldwide recognition has emerged and Cubans on the island seem eager for political and economic change and reforms. Changes in attitudes have also been noted in the Cuban community in exile. Two recent polls conducted in Miami revealed that the attitudes of exiled Cubans towards the Cubans on the island have changed from one of confrontation to one of more contact and support that could possibly lead to a future reconciliation. The first poll, which was conducted in Miami in 2001, revealed that the majority of exiled Cubans favored exchange and travel to the island, and felt that U.S. government policy of the “Cuban Economic Embargo” had been a failure (Oppenheimer, 2001). A second poll, conducted in 2003, revealed that the great majority of exiled Cubans support the efforts of democratization led by the dissident movement on the island, the “reconciliation” of the Cuban community in exile with the Cubans on the island, and a “peaceful transition” out of totalitarian rule. The great majority of exiled Cubans also endorsed the idea that the leadership of the “transition” must come from the people inside and not from those outside the island (Elliot & Del Valle, 2003). In contrast to the first two polls, a third poll, conducted in early 2004, revealed that there was little support for Cuban dissident Oswaldo Payá’s Varela Project, and that many Cuban-Americans in Miami still maintain hard-line attitudes towards Fidel Castro and want to continue the United States’ economic embargo towards Cuba (Corral, 2004). However, this poll was quickly criticized for its methods in its design and implementation. Finally, another recent poll (June, 2004) by Bendixen and Associates, measuring political party affiliations among the Cuban- American community in Miami, also highlights the recent changes among Cuban-Americans in the political arena (Clark, 2004). This poll calls attention to the fact that Cuban-Americans no longer constitute a traditional monolithic political block, voting unconditionally in favor of the Republican Party. Instead, Cuban-Americans who arrived in the U.S. after 1980 and those who were born in the U.S. tend to favor the Democratic Party, with those who arrived prior to 1980 remaining loyal to the Republican Party. Attitudes of exiled Cubans have also been examined throughout the U.S. and other countries. A study conducted in 1994, surveyed 4,676 exiled Cubans living in various parts of the U.S. and several other countries. It reported that only 20% of those interviewed expressed a desire to “return to live permanently in Cuba.” However, almost half expressed a desire to own a second home or to visit Cuba “after the fall of communism” (Clark, 1994). Gmelch (1980) has studied the phenomenon of “return migration” in various countries. He reports that “return immigrants” usually have a slight educational advantage over the average individual in the home country. He classifies the two main reasons for return as: (1) strong family ties and a desire to be among “one’s kin”; and (2) patriotic feelings of wishing to help the homeland (in the case of Cuban exiles, the goal of “reconstruction”). He describes the phenomenon of “reverse culture shock,” by which the return immigrant encounters disappointment as he realizes that “life has moved on while he was away,” and that the value system, personal affiliations, and emotional ties have been severed and have suffered discontinuity. Another realization is that “younger generations” have replaced them and now occupy their place in the society of the home country. Also, the return immigrant frequently encounters inefficiency, a lack of punctuality, and other qualities that he finds to be “annoying,” as he moves back from an industrialized society to a country with a rural or small economy. The return immigrant is frequently surprised at the difficulty to re-adapt to the society where he was first socialized. As a result, many “return immigrants” become “shuttle immigrants,” traveling back and forth between the host and the home country. The transition from a totalitarian regime to a democratic society has proven to be a very complex sociopolitical and psychological process for those individuals from Central and Eastern Europe. For example, in Poland, Bruhn (1994) observed that the communist way of life offered “predictability and safety,” which can be abruptly lifted during a transition. Poland has suffered an enormous increase in unemployment and erosion to the system of free education and medical care. For the first time in more than 50 years, Poland has been faced with another difficult challenge—the reintegration of “return immigrants” and new immigrants of different ethnicities, including people of color. Bruhn (1994) has designed a classification of coping styles to better understand the Poles’ adaptation to change in the transition. He underscores the difficulty of many Poles in embracing the political, social, and psychological changes by quoting a study in which 70% of the sample of Poles that were studied, “were unsure if the changes that have taken place in their country are for the better or for the worse” (Bruhn, 1994, p. 159). In Russia, Shiraev and Glad (1999) observed that during the transition from totalitarian to democratic rule, people become confused with their expected responses to authority and initiative. Many of these individuals, when asked about individual decision making without supervision, become confused and frustrated. Additionally, sharp generational differences exist in responses to the transition. The elderly usually long to return to “the old order,” whereas those in the middle generation (who lived their childhood and adolescence under communism and are now adults) were the most politically active. Having seen the “before and after,” the middle generation struggles with the most uncertainty about the future and the majority advocate a continuation of free education and health care for the population. The younger generation, who have no memory of communism, become socialized during a period of “restructuring” when values are fluid and seem to “believe in nothing.” Their lives are ruled by blatant consumerism and materialism and they are prone to antisocial behaviors. Only 3% of the members of the younger generation support the old communist party. Smith (1999) studied the different reactions to transition among Russians of different age cohorts. He emphasizes the importance of the “psychological dimension” of political transitions and quotes Mikhail Gorbachev’s dictum that “for a political transition of a country to take place, ‘new thinking’ must also take place among the country’s population” (Smith, 1999, p. 135). Smith (1999) has developed a six-step model to explain the psychological stages that citizens undergo during a transition. 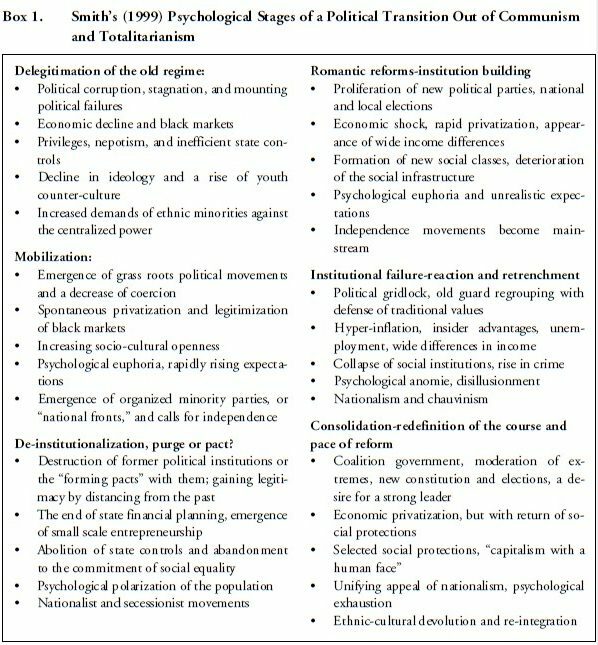 These six steps are: (1) delegitimation of the old regime; (2) mobilization; (3) de-institutionalization- purge or pact; (4) romantic reforms- institution building; (5) institutional failurereaction and retrenchment; (6) consolidation-redefinition of the course and pace of reform. He further divides each stage into five areas covering: (1) the political system; (2) the economy; (3) a social level; (4) a psychological level; and (5) an ethnic-regional level. He bases his model on the experience of transitioning African countries from authoritarian rule to democracy. This template, developed by Smith (1999) in order to understand the transition of Russia out of communism and reproduced in Box 1, may prove to be useful in understanding the Cuban process. However, in spite of the commonalities that exist among all human beings, the Russian model may not be directly applicable to Cuba, but may require certain adaptations and modifications given the significant differences that exist between these two countries and their cultures. Shiraev (1999) highlights the psychological difficulties that many Russians have encountered during the transition. He lists the hierarchy of priorities chosen by Russian citizens, such as family, security, and human values. He emphasizes that many Russians are willing to give up certain civil liberties in order to recover the previous stability and safety that existed under communism. Wieckzorkowska and Burnstein (2001) have designed a classification of two psychological typologies and how these two different groups of individuals adapt to change in a transition. They conclude that “point strategists” (who are more focused, selective, and tenacious in their pursuit of goals) are better suited to survive and adapt in a capitalist society, whereas “interval strategists” (who are less selective, more flexible, and less tenacious in their pursuit of goals) are better suited to adapt and survive in totalitarian systems, where the options are limited and opportunities for improvement are scarce and sporadic. Obtaining reliable information from Cubans living on the island presents a challenge to investigators, given the lack of freedom of speech, the rigid governmental controls on the dissemination of information, and the fear of reprisal that is experienced by the average Cuban residing on the island. Wooden and collaborators (2002) attempted to study the attitudes of Cuban youth living on the island and how these were affected by the collapse of the Soviet bloc. They conducted a survey in Havana, randomly approaching people that they met on the street. The sample consisted of seventy Cubans, 14 to 29 years old. The results of their study appear to be seriously compromised, since these investigators failed to take into account the repressive nature of the totalitarian regime that exists in Cuba today, which would preclude any individual to answer questions openly, especially if these questions were formulated by a stranger. Inkeles and Bauer (1968) faced a similar dilemma in 1951, when they attempted to study the Soviet system at the height of the Cold War. In what became known as the “Harvard Project on the Soviet Social System,” these investigators interviewed individuals that were within days of having crossed the “Iron Curtain” into Western Europe. They formulated the interview reminding the subjects to “answer as if they were still living in the Eastern bloc.” Utilizing this method, these investigators theorized that, given the circumstances that existed at the height of the Cold War and the limitations of accessing reliable information from within the Soviet bloc countries, this method was the one that most closely approached accuracy. 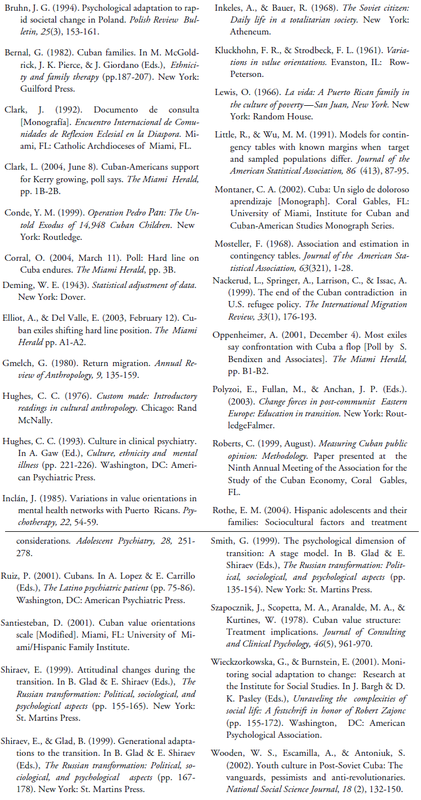 Roberts (1999) conducted a survey on recently arrived Cubans in South Florida and this study became known for advancing the sampling methods for assessing the behavior of immigrants. The researchers used techniques similar to the U.S. Census Bureau in a sample of Cuban émigrés who had been in the U.S. for three months or less. Roberts and his team studied the immigrants’ opinions regarding: (1) remittances of money by relatives and humanitarian aid to Cuba by the U.S. government; (2) human rights and incarceration of dissidents; (3) opinions on the health and educational systems; (4) the Cuban media and modes of obtaining information; (5) reaction to young and old political leaders; (6) moral values and the Catholic Church; and (7) opinions with respect to the future political transition of the country among others. They were also interested in measuring the mood of the Cuban people as a result of the collapse of communism in the former Soviet Union and the change in U.S. policy toward Cuba. The purpose of their study was to assess the impact of these two factors on the emergence of a new civil society in Cuba and to better understand their viewpoints of Cuban society. Some of the most important findings of this study include: (1) college applications and attendance have declined in Cuba, with members of the new generation choosing to work for the tourist industry, where they can have access to foreign currency; (2) the respondents reported satisfaction with improvements in education and health as the major accomplishments of the revolution; (3) the majority of the respondents rejected government propaganda that blamed the U.S. embargo for the financial problems that exist in Cuba today; (4) most of the subjects were unaware of the activities of the political dissidents; (5) the perception of the Cuban government leaders was very negative; and (6) the overwhelming majority supported democratic capitalism as the government system they hope Cuba has in the future. Presently, no attempts have been made to study and compare the differences in value orientations of Cubans on the island and those living in exile in Miami or other parts of the world. This pilot study represents the first step for refining our methods and generating data to ensure that a larger study can be successfully implemented in the near future. Since accessing the opinions of Cubans living in Cuba is impossible or unreliable, we took into account the experience of the previously mentioned investigators and designed our pilot study to include recently arrived Cubans, who had been in Miami no longer than six months, and who had traveled directly from Cuba to the United States, without having spent time in another country prior to arrival in Miami. The research protocol was presented and approved by the Internal Review Board (IRB), Human Subjects Research, University of Miami School of Medicine, in accordance with 45 CRF 46.110(7) Research on individual or group characteristics of behavior. Our study included a convenience sample of Cuban émigrés 18 years old or older. The subjects were approached while they were receiving orientation to life in the U.S. at the offices of Church World Services, one of two religious organizations in charge of providing aid and orientation to recently arrived Cubans in Miami. Each subject was provided with an informed consent document (in Spanish) that described the purpose of the project and how the data would be used. The informed consent document was also read to the person in Spanish, and the person was asked if there were any questions about the process of giving consent, or questions regarding any of the content in the informed consent letter that the person had not understood. The informed consent document also emphasized that participation was voluntary, that no identifying information would be collected, and that great care would be taken to ensure confidentiality. If the person agreed to participate, he or she was given a questionnaire (in Spanish) consisting of 50 questions. The length of time necessary to complete the questionnaire was approximately 45 minutes. The questionnaires were administered in the conference room of the Church World Services Office in the presence of one of the researchers. The persons participating in the study were invited to ask the researcher for clarification about any of the questions that appeared in the questionnaire, or any other part of the study that they did not understand. The documents were kept at the Institute of Cuban and Cuban-American Studies, where only the investigators had access to the data. Unit 1: Measures demographics and background information, characteristics of the person’s living conditions in Cuba, means of transportation, opinions about the medical system, experiences in traveling outside of Cuba, opinions about whether the person would return to Cuba if certain political and economic changes took place, what kinds of political and economic changes the person would want to see take place in Cuba in the future and which mechanisms they used to obtain information while living on the island. Unit 2: Asks questions about the person’s income and his/her “self-perception of his/her social class” while living in Cuba. It also asks, with which characteristics of Cuban society the person had the most difficulty coping, if he/she would be in favor of free enterprise in Cuba in the future and what was his/her opinion regarding the U.S. embargo towards Cuba, while living on the island. Unit 3: Asks seven vignettes measuring the subject’s value orientations, covering the domains of man’s relationship to: (1) time; (2) authority; (3) human nature; and (4) activity. These vignettes are adapted from the original Value Orientations Scale (Kluckhohn & Strodbeck, 1963), and they were further modified by Szapocznik and collaborators (1978) and Santiesteban (2001) to measure value orientations of Cubans living in the U.S. For this study the questions were tailored to reflect issues that portray the present Cuban reality. Data were analyzed using the Statistical Package for the Social Sciences software. Frequency and descriptive statistics were calculated to check all relevant characteristics of the data. Continuous variables were tested with the Student’s t-test to detect differences among groups. For categorical variables, Pearson’s chi-square was employed to determine any significant differences in proportions. The alpha level used for all analyses was = .05. The initial sample consisted of 184 subjects, of which 13 were eliminated due to incomplete data. The final sample consisted of a total of 171 subjects, with 62% being male and 37% being female. One subject did not list his or her gender. The mean age of the total sample was 34.0 years (SD = 12.1). The mean age of the males was 33.4 years (SD = 11.6), and the mean age of the females was 34.9 years (SD = 13.0). The analysis of the data gathered in the pilot study is divided into three parts: (1) demographic, participant characteristics, and social opinions; (2) value orientations; and (3) political opinions. Each of these are in turn divided into numerous sections. For reasons of space, we will only discuss in this paper the findings related a few selected areas. For a thorough treatment of all findings, the reader is directed to the full report (footnote 1). Access to Foreign Currency: The vast majority of the respondents (90%) stated that they did not have access to foreign currency. Of those who had access to foreign currency, 47% reported that they received hard currency from relatives abroad. There was a statistically significant correlation (p=.02) between “Gender” and “Receiving Money from Abroad,” with females more often (58%) receiving money from abroad than males. It is estimated that approximately $400 to $500 million enters the island each year from relatives and friends in exile to help their families and friends buy food, medicine, and other necessary essentials. 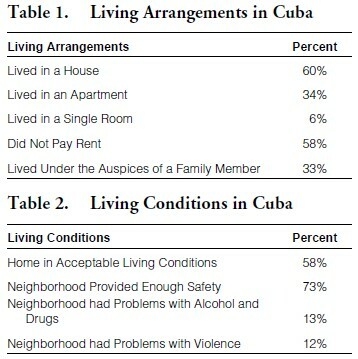 However, the data from the individuals surveyed in this study allows us to propose that perhaps one of the many conditions contributing to a person’s decision to leave the island is the fact that he or she received limited or no help from relatives and friends in exile (Political vs. Economic reasons to leave Cuba). This hypothesis could be examined further in future studies. The Cuban Medical System: Eighty-one percent of the respondents rated the Cuban medical system as “good or average,” and 14% rated it as “poor.” Cuba promotes the success of its health system and the fact that per capita, Cuba has more trained doctors than any other third-world country. Many of these doctors have been sent on international missions to countries like Angola and Venezuela to meet the health needs of these countries and simultaneously to export revolutionary ideals. Today, Cuba’s health system has suffered from a decline in available medicine, equipment, etc., and this reduction is affecting the individuals with lower socioeconomic status. The most advanced health care in Cuba is reserved for those that can pay with dollars or for visiting tourists. Interestingly, 94% of respondents indicated that they would not change the Cuban medical system in the future. Nature of Human Beings: The responses elicited to the question of whether there is a need to have laws in society are given in Table 3. This question is of particular relevance, due the “police state” that has existed in Cuba for the past forty-five years, and to the climate of amorality and “survival of the fittest” that has resulted as a consequence of the financial crisis that followed the collapse of the Soviet bloc. Slightly more than one fourth of the individuals in the sample (28%) believe that human beings are: “essentially evil.” These individuals will be prone to experiencing distrust with regards to the motivations of others. They can also be prone to being hyper-vigilant and paranoid, and to distrust not only the motivations of their peers, but the motivations of their leaders or anyone in a position of authority. These individuals will tend to perceive authority as oppressive, persecutory and exploitative and may have difficulties in adapting to a “Civil Society,” such as the one that exists in pluralist societies, unless their trust is restored and their perceptions are able to change over time. A similar number (30%) perceive human beings as “essentially good.” These individuals will continue to place their hope and trust in others. A greater number (42%) believe that human beings are “neither good nor bad” (neutral), but that “laws are necessary to maintain order.” If the latter two groups are added together, those who believe people are “essentially good” (30%) and those who believe they are “neutral” (42%), we find that the great majority (72%) are not essentially distrustful of others. These individuals “have not given up on humanity,” but see humans as responsive to their surrounding circumstances (neutral), or as “essentially good” and well intentioned. As a consequence, the individuals who offered these two responses will be more likely to integrate successfully into a civil society, such as that of the U.S., where it is necessary to have a basic trust in authority and in institutions that have been created for the common good—not to oppress or abuse the citizens. These latter two groups will therefore be more likely to accept, and to adapt to the rules and regulations of a civil society. This question addresses a current dilemma experienced in the daily lives of Cubans living on the island: the decision to abandon the person’s chosen profession (in this case the medical profession) for a position that will provide the person with access to foreign currency and in turn, allow him or her to survive financially during the present crisis. Only a minority of the respondents (15%) chose to consult with their superiors (paternalistic government authority), demonstrating either a distrust, or a growing disengagement from the response to totalitarian authority that would have been expected a decade earlier. A larger number (42%), resolved this dilemma by consulting “someone of authority within the family” (head of the family), more in keeping with the pre-revolutionary Cuban values and traditions, shared by other Hispanic people not living under communist rule. People of Hispanic origin traditionally endow the “head of the family” (usually the father or grandfather, and in some matriarchal families, the mother or grandmother) with “respect” (respeto), which acknowledges that this person holds the highest position of authority—he is consulted in all major decisions affecting the family and occasionally also holds the keys to the family wealth (Bernal, 1982; Ruiz, 2001). It is important to note that, even after forty-five years of communism, a significant number of the individuals in this sample still adhere to the tradition of placing “the head of the family” in the highest position of authority, a characteristic that is deeply ingrained in the Hispanic culture. A slightly larger number of the individuals (43%) decided to “make their own decision,” demonstrating autonomy from both, the family hierarchy and the governmental authorities in their decision making. Additionally, if one adds the percentage of respondents in favor of family authority (42%) and those in favor of individual self-determination (43%), this yields a total of 85% of the individuals in this sample who do not adhere to a paternalistic political authority that dictates the decisions of the individual. Shiraev and Glad (1999) have described how, in communist societies, obedience to government authority is strongly enforced and initiative and individualism are strongly discouraged. They add that, individuals who have been raised under communism, when faced with a transition to democracy and capitalism, often become confused about societal expectations that seem to run contrary to everything that they had learned until then. The value system of the individuals in our sample who chose their own “self determination” (make their own decision) is more congruent with the values of a capitalistic society with a free market economy, and therefore it could be assumed that these individuals will probably be more likely to adapt quickly and effectively to U.S. society. In these individuals, these particular values of “initiative” and “self determination” run against the norm and could have become potentially problematic in a totalitarian society; therefore, they may have played a role in their decision to emigrate. A seemingly contradictory statistically significant correlation resulted when comparing the responses to this question by gender. Women were more likely to employ initiative and individual self-determination (49%) than men (39%), and less likely to consult with superiors (7%) than men (20%). However, men (41%) and women (44%) were comparably inclined to consult with the family authority figure on the matter. One possible explanation for this finding could be based on the fact that men in Cuba are more often the family’s principal financial provider, and are more likely to be present in the workplace, where obedience and conformity with the system are demanded. Women, on the other hand, are more likely to be concerned with the daily procurement of goods for the family, and thus may be able to use their inventiveness and “work behind the curtain” in order to provide “the best they can” for the family, even when this is done outside of the established governmental channels. Initiative vs. Passivity; Government vs. Family vs. Friends and Connections: The responses elicited to the scenario “You are having financial difficulties and cannot support your family” are as follows: 65% of the respondents indicated they would find a second job (individualistic response), 23% that they would ask family and friends for help, and 12% that they would ask the government for help. This question depicts a common scenario in the life of the average Cuban person, who may find himself or herself unable to support his or her family with his or her current, government sanctioned job and is forced to consider other options outside of the official channels. The minority of the respondents (12%) opted to “ask the government” for help, perhaps indicating a diminishing trust and reliance on the paternalistic role of the government, as the main source of “problem-solving” in the day-to-day lives of Cubans. Almost a fourth of the respondents (23%) opted to rely on family and friends for help, resorting to the Hispanic cultural and traditional mode of networking among family and friends (Bernal, 1982; Ruiz, 2001)—a mode of relating to others that does not appear to have been changed by the Revolution. However, the majority of individuals (65%) opted to “find a second job,” demonstrating initiative, individualism, and self-reliance. This style of problem solving could be potentially problematic if the individual lives under a totalitarian system that demands that citizens demonstrate obedience, submission, and paternalistic dependency. Perhaps these same characteristics may have played a role in the decision of these individuals to leave Cuba. However, these same characteristics of initiative and self-reliance could represent an advantage to these individuals if they lived in a country with a capitalistic, free market economy. Opinions Regarding the U.S. Economic Embargo on Cuba: The subjects were asked if they were in favor, or against the U.S. economic embargo while they lived in Cuba. Their responses are as follows: 57% were opposed to the economic embargo, 36% were in favor of the economic embargo, and 7% did not respond to the question. A statistically significant correlation (p=0.028) was found between “In opposition of the Embargo” and “Social Class,” with 63% of those identifying themselves as “poor” opposing the embargo, while 37% of those considered as middle/ upper class opposed the measure. Cubans on the island feel strongly that normalizing relations with the U.S. is a key component to normalizing politics in Cuba and necessary in mitigating the material, social, and political challenges of succession or transition. In other words, improvement in U.S.-Cuba relations is viewed as an important component of alleviating hardship today and stabilizing politics later, perhaps helping to reduce the enormous challenge of rebuilding post-Castro Cuba. 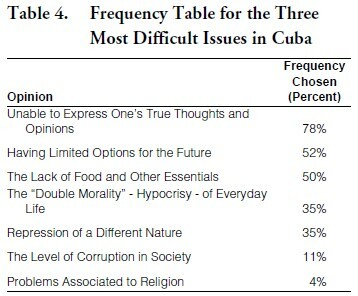 Opinions Regarding Difficulties Experienced while Living in Cuba: The subjects were asked to select “the three most difficult issues they encountered while living in Cuba.” The frequency with which the answers were chosen is given in Table 4. Seventy-eight percent of the respondents indicated that one of the most serious difficulties they faced was the inability to express one’s true thoughts and opinions, while 52% chose having limited options for the future, and 50% the lack of food and other essentials. Although economic well-being is a significant challenge, Cubans on the island more often stated that the lack of freedom is the most important issue they encountered each day under Castro’s “totalitarian regime.” In other words, will any future post-Castro government or regime, especially in the case of a succession of power, be able to hold off on demands for political and civil rights by arguing that economic issues need to be addressed first (Chinese model of transition)? The results of this survey somewhat undermine the argument that what Cubans on the island perceive to be most important is addressing their immediate material needs. In fact, one can extrapolate that Cubans on the island see a more open society as an integral ingredient of material satisfaction. Individual rights and freedom and material well-being are perhaps viewed as inseparable rather than in conflict. Opinions on Returning to Cuba and the Exiles: Seventy-four percent of the respondents indicated that they would not consider returning to live in Cuba if the political and economic system changed, while 22% indicated they would consider returning, and 4% did not offer an opinion. In response to the question “In your opinion, how do Cubans on the island perceive Cuban exiles living outside of Cuba,” 60% of the subjects indicated that they were perceived with friendship, 25% with caution, 6% with fear, 6% with hate, and 3% did not respond. Seventy percent of the respondents favored the return of the exiles to Cuba, while 27% were against their return, and 3% expressed no opinion. Cubans on the island are tired and overwhelmed by the heavy politicization or ideological content of everyday life. Escapism, frustration, and alienation are prevalent. This is a challenge in terms of building a civil society and in creating values and attitudes that are conducive to building social capital (i.e. trust and cooperation) between the individual and the state. The results of the survey also indicate that 74% would not favor going back to Cuba other than to visit family. Life has been so challenging in so many different ways that Cubans would like to start anew and forget the past. The idea of going back to rebuild a society is not appealing to many. In addition, the survey indicates that there seems to be a positive view of Cuban exiles and their participation or contribution to a future government or regime in Cuba, despite the official Cuban government rhetoric and cross-channel hostility that has existed for over 45 years. This opinion may be a result of the interaction (family visits) and financial support of relatives which contradicts the regime’s propaganda concerning the Cuban exile community’s intentions. • The systems in transition are typically characterized by the coexistence of the “old” and the “new” structures, values, and attitudes. • The emergent “new” state may have a few common elements with the “old order.” The wider apart the “old” and the “new” states are initially, the more difficult the transition process will be for its citizens. • As the “old” state begins to transform, the “human needs” of its citizens, such as shelter, food, jobs, security, etc., must be addressed immediately by the state or the transformation to a “new” society might collapse. • The transformation process of values and attitudes is not one-dimensional, but rather affected by multiple factors simultaneously. Our pilot study’s preliminary results demonstrated these four principles and provide us with some very important data that suggest that Cuba’s future government or regime will have to first meet high social expectations for human security before proceeding with other necessary reforms (political, economic, legal, etc.). These government reforms will have to take into serious consideration the fact that many Cubans on the island have a high level of distrust for the current institutions and authority. Their human behaviors have been dominated by the surrounding realities they face each day (lack of food, poor transportation, political rhetoric, unclear future, and so on). Based on our preliminary results, the biggest challenge to any future Cuban government will be the reconstruction and re-socialization of a new ideological system that will entail the learning and adoption of new values, beliefs, and norms that would help create a “new” civil society. Based on similar studies done in Central and Eastern Europe after their transitions (Bruhn, 1994; Inkeles & Bauer, 1968), these changes to the individual’s social behavior will create psychological problems as people begin to adapt to the “new” social and political measures being implemented. The problems could range from demoralization to severe trauma, as we have seen in Central and Eastern Europe during their transition. The need for urgent psychological reconstruction has been recognized by a number of international agencies as the key to any form of successful transition. In the confusion of “change,” it is not uncommon for those affected to experience lack of confidence, low morale, distrust, and nostalgia. The re-establishment of morale and restoration of confidence is an arduous process that often creates a feeling of nostalgia for past practices and lifestyles, particularly among the “older” generation. In many post-Soviet bloc countries people found the implementation of unfamiliar “new” policies and practices difficult to cope with. Finally, based on our results, we found that 37% of Cubans surveyed indicated a level of distrust for Cuban- Americans (25% viewed them with “caution,” 6% with “fear,” and 6% with “hate”). In comparison, a similar study done in post-Soviet countries, reported that 24% of the population distrusted the exiles from those countries. We interpret this to be a very significant factor in the transition of a post-Castro Cuba. Cuban-Americans and other exile Cuban groups around the world will have to show great restraint in their attempts to influence, too quickly, what a “new” Cuba should look like without taking into account the role of Cubans on the island, whose opinions about the future of Cuba will, at times, be very different than that of the exiles. At the same time, our survey suggests that Cubans on the island do see Cubans in exile playing a role in the transition, including their return to live on the island, their role in the economy and business, and their participation in the political process. This all seems quite possible, but it will likely take more time to accomplish than most of us tend to think or believe. The well known Cuban author, Carlos Alberto Montaner writes in his paper entitled “Cuba: Un Siglo de Doloroso Aprendizaje” (Cuba: One Century of Painful Learning, May 2002) that throughout its history, “Cuba has always had the appearance of a democratic republic, yet the pillars that support the democratic life of a civil society were always lacking.” The future goal of Cuba should not only be to develop a civil society but, more importantly, sustain it in order to facilitate a true democratic transition. 1. Gomez and Rothe are the Principal Investigators in the project. Frank Mora, Hector Castillo-Matos, and John Lewis are Co-Investigators. Juan Clark and Ramon Colás are Project Consultants. This is an abridged version of the full report prepared by the research team, Value Orientations and Opinions of Recently Arrived Cubans in Miami, Institute for Cuban and Cuban American Studies, University of Miami, 2004, available at http://www.miami.edu/iccas/Value_Orientations_Doc.pdf.